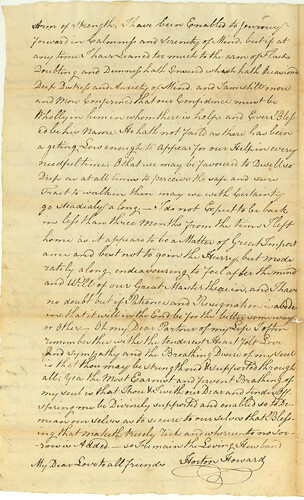 When we left Part 1, Samuel Forrer had written a letter to his beloved Sarah’s father Horton Howard, asking permission to marry her and hoping that, if he objected, it would be “only on the ground that I am not a member of your society.” And by “society,” he meant the Society of Friends, or Quakers. This piqued my interest, so I decided to do a bit of searching into the marrying customs of Quakers. The most useful resource that I found on the subject was The Quaker Family in Colonial America: A Portrait of the Society of Friends by J. William Frost (New York: St. Martin’s Press, 1973). Granted, I wasn’t interested in the colonial period, but the 1820s; however, Frost’s work was the most comprehensive scholarly book I could readily get my hands on—and after all, this was just an intellectual curiosity—and I figured that the colonial period would be close enough for general background on Quakers customs. I did a little investigating into Frost himself, finding that he was a well-credentialed Quaker scholar and historian, and was later a professor at Swarthmore College, a Quaker college in Pennsylvania (which incidentally has his Papers). “The Quakers, who had no sacraments, agreed to register the event of a marriage ceremony with the government, but they insisted that since God alone could join people in holy wedlock the meeting should participate in all formalities” (p. 150). (The “meeting,” by the way, is the basic organizational unit of Quakers, like a congregation.) 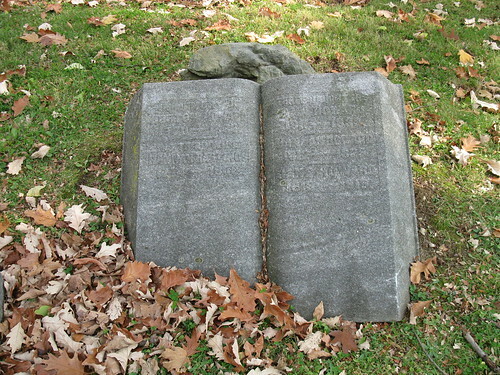 Quakers married each other; they were not married “by” someone. This was part of the objection to marrying outside of the Society “since a marriage involving a non-Friend entailed being wed by a cleric” (p. 158). “Parents had the right to consent to the marriage of a son or daughter no matter what their ages… If…the parents allowed or did not actively oppose a marriage out of unity, Friends might discipline them and the newlyweds” (p. 155). A “marriage out of unity” was a marriage someone who was not a Quaker. “The records of monthly meetings in America illustrate the great amount of time devoted to the problem of improper marriage. Throughout the colonial period marriage out of unity was the most frequent offense for which Quakers were disowned” (p. 159). Furthermore, Frost further states that by 1765, about 75% of Quaker marriages were “exogamous” (p. 159). From the sound of it, “marrying out” was rather common, at least in the colonial era. And I’m guessing that trend didn’t suddenly reverse itself as time went on. Anyone who was disowned for an offense, including “marriage out of unity” or “marriage contrary to discipline” (being married by a cleric), “who appeared to be sorry and was willing to confess his sin could in time gain readmission. … The admission of guilt was not…for marrying a particular person but for violating a tenet of the Society” (p. 160). And finally: “While there were no direct challenges to the endogamous pattern of marriage in meetings, both the frequency of marriage out of unity and the occasional comments show that some Quakers questioned this tenet” (p. 160). A search for members of the Horton Howard family in the Encyclopedia of Quaker Genealogy by W. W. Hinshaw (Ann Arbor: Edwards Brothers, Inc., 1936+) yielded some interesting results and examples of the above. With a little help from this Glossary of Quaker Terms on Ancestry/RootsWeb, I was better able to understand the meanings of the abbreviations used in Hinshaw’s Encyclopedia. HOWARD. 1827, 5, 3 [May 3, 1827]. Sarah Forrer (form Howard) con mcd. What did that mean? I already knew that Sarah Howard did marry Samuel Forrer on February 8, 1826. The Glossary of Quaker Terms helped me understand. It meant that Sarah (Howard) Forrer had “condemned” her own misbehavior, that misbehavior being “marriage contrary to discipline.” (They were married by a reverend.) [Incidentally, Sarah’s sister Mary was “disowned” the following year later for the same offense, a record on the same page indicated.] I found it a little strange that there was no mention of a “marriage out of unity” since Samuel Forrer himself stated that he was not a member of the Society of Friends. Perhaps he joined? However, Samuel Forrer is mentioned nowhere in Hinshaw’s compendium. Interesting. HOWARD. 1829, 1, 1 [January 1, 1829]. Horton &w, Hannah, &dt, Ann, dis jH. My high school Latin teacher, an elderly Catholic nun who was usually slightly disgruntled anyway, always used to get exasperated with us for not having enough “intellectual curiosity.” She’d hint at something we ought to look up—but not “assign” us to do so—and then act all surprised the next day when we hadn’t looked it up. What did she really expect from a bunch of 16-year-olds who had friends, boyfriends/girlfriends, sports, extracurriculars, 6 or 7 other classes, and a bunch of other regular “assigned” homework to do (including nightly Latin assignments)? This isn’t a story about my high school Latin teacher, though. It’s about a civil engineer who fell in love with a young Quaker woman at Cincinnati in the mid-1820s. And sometimes, I come across “cool old stuff” that gets my intellectual curiosity sense going, and I just know that (a) I’ve just got to look into it further, and now that I have a blog (b) I’m going to share that journey with others. Now is one of those occasions. 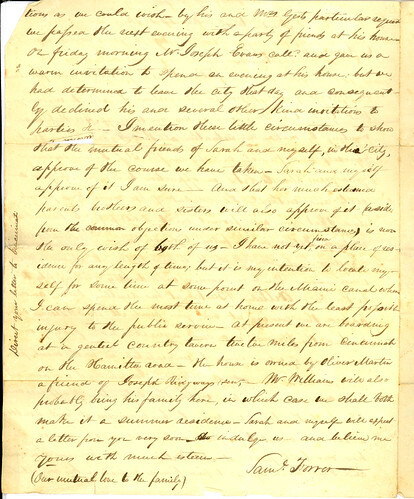 A few weeks ago, while processing the Forrer-Peirce-Wood Collection (MS-018) – something you may hear me talk about frequently over the next several months, as it is quite large – I came across the following letter (well, draft of a letter, really). 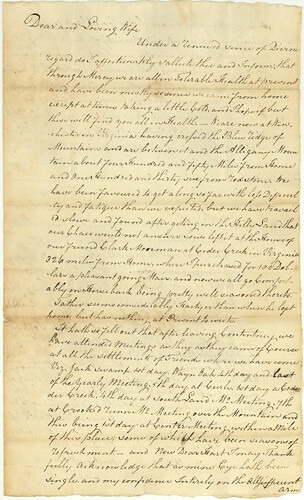 The final version of the letter was sent from Samuel Forrer, a civil engineer at Cincinnati who was involved with the construction of Ohio’s canal system, to Horton Howard, a Quaker leader in the Delaware/Columbus area. Your late visit to Cincinnati and the consequent accidental circumstance of leaving your amiable daughter Sarah Howard, at my friend with the family of my good friend M. T. Williams has given me an opportunity of forming and cultivating an acquaintance I have long since ardently desired. The result of this acquaintance has fully satisfied a conviction on my part that Sarah was a determination on my part to make Sarah a tender of my affections; which I did and am now happy to say that I have received from her an acknowledgement that she reciprocates them— In short we are morally engaged to be married, with the condition on the part of Sarah that you her much loved parents do not forbid it unconditionally— I am aware sir that the rules of the Society of Friends imperiously requires parents to guard against the intrusions of strangers; and that, consequently I must not expect that you will give consent to our union— But may I not hope that your acquaintance with my character will warrant me has given you an impression not unfavorable to my character that you will object only on the ground that I am not a member of your society? 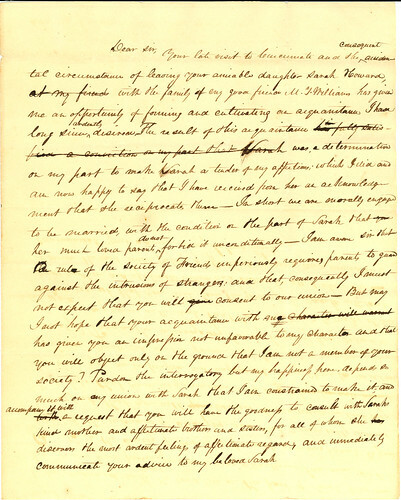 Pardon the interrogatory but my happiness here depends so much on my union with Sarah that I am constrained to make it, and for the accompany it with a request that you will have the goodness to consult with Sarah’s kind mother and affectionate brothers and sisters, for all of whom she has [discovers?] the most ardent feelings of affectionate regard, and immediately communicate your advice to my beloved Sarah. So many things about this letter jumped out at me that I was compelled to look into it further. The most striking thought I had was, So apparently Quakers do not like their children to marry non-Quakers? And Samuel Forrer states right here that he is a non-Quaker, while I know that Sarah Howard was one… And I’m going to go ahead and spoil things for you right here and tell you that, yes, they do get married. But what did her father say initially? Did he give permission, or did they disobey him? There are several other letters from Horton Howard to the Forrers in the collection, so if he was mad, he obviously wasn’t that mad, because they seem to have remained on good terms. I also wondered about these Quaker marriage rules in general. I think I’ll leave it at this for Part 1. Stay tuned for Part 2. The Forrer-Peirce-Wood Collection (MS-018) discussed here can be found at the Dayton Metro Library, Main Library, Local History Room, 215 E. Third St., Dayton, OH 45402. For more information on the collection, contact the library, or feel free to leave a comment on this blog. They say you learn something new everyday. I’m almost certain that’s true. And my new thing I learned today was a little something about Quaker dating. No, I’m not talking about how two young Society of Friends lovebirds might spend time together before marriage… I’m talking about a method of formatting written dates from the calendar. What the…? I wondered. I mean, I could sort of logically figure out that the “8th month” is August, meaning the date was August 9th, 1833. But why would the date be written that way? As I continued, I found a few more letters dated in the same manner. Every instance I found was in correspondence among the family of Horton Howard, who, I had found out when researching the various families in this collection including him, was apparently rather important in the Quaker movement in eastern Ohio. So that made me wonder, Maybe it’s a Quaker dating thing? Sure enough, thanks to “Quaker Dating before 1752” (don’t let the title fool you – they talk about post-1752 also) from the Swarthmore College’s Friends Historical Library, I found that my hunch was correct. Apparently, it was common practice for Quakers to refer to months by their numbers rather than their names. This practice originated because the Quakers objected to the month names given for pagans and pagan gods (e.g., January for Janus the Roman god of doorways; July for Julius Caesar, etc.). If you are interested in the specifics of the practice and the changes they made in 1752, please check out that Swarthmore College page linked above. Interesting stuff, and I thank them for posting the info, because as an archivist, I was really just trying to give my folder the proper date and wanted to be sure what the proper date actually was! Sort of as an aside… In addition to the unusual dating method, the contents of the actual letter were quite interesting as well. Its subject matter pertained to the first cholera epidemic in Columbus, Ohio, which occurred from July-October 1833. 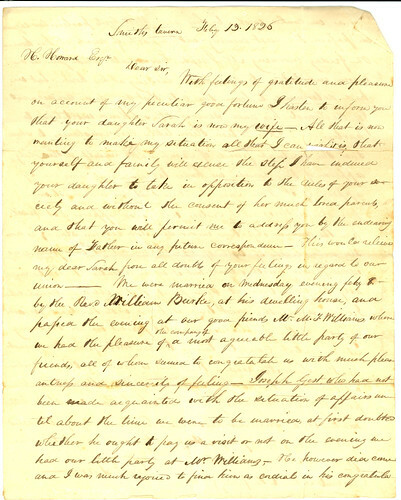 The letter was from one Ebenezer Thomas to John Howard (son of Horton Howard) at “College Gambier, Knox County, Ohio, ” (I assume that was an early way of referring to Kenyon College, which was founded in 1824 – how many other colleges could there have possibly been in Knox County, Ohio, in 1833?). By request of thy Father I write to inform thee of the Death of thy dear sister Ann of Cholera, also the two eldest children of Harvey D Little [husband of John’s sister Mary] same complaint[.] Thy Father, Harvey and his wife and the other child have all been very ill, but are now much better. Thy mother in usual health. The material discussed here can be found in the Forrer-Peirce-Wood Collection (MS-018), which is currently being processed (by yours truly) and will soon be ready for research at the Dayton Metro Library, Main Library, Local History Room, 215 E. Third St., Dayton, OH 45402. For more information on the collection, contact the library, or feel free to leave a comment on this blog.